Silanes (compounds of silicon and hydrogen, of the formula Si n H 2n+2 ) and other monomeric silicon compounds have the ability to bond inorganic materials such as glass, mineral fillers, metals and metallic oxides to organic resins. The adhesion mechanism is due to two groups in the silane structure. The Si(OR) 3 portion reacts with the inorganic reinforcement, while the organofunctional (vinyl-, amino-, epoxy-, etc.) group reacts with the resin. The coupling agent may be applied to the inorganic materials (e.g., glass fibers) as a pre-treatment and/or added to the resin. Silanes, hybrid organic-inorganic compounds, can function as mediators and promote adhesion between dissimilar, inorganic and organic matrices through dual reactivity. They are called primers, coupling agents, or sizes, depending on their function and substrates.This article aims at giving an introduction to silanes in dentistry, mainly emphasizing on chemistry and silane applications. The basic building block of silicon chemistry, silanes are monomeric silicon compounds with four substituent groups attached to the silicon atom. These substituent groups can be nearly any combination of nonreactive, inorganically reactive, or organically reactive groups.The basic structure of organosilanes is RnSi(OR)4-n with "R" being an alkyl, aryl or organofunctional group and "OR" being a methoxy, ethoxy, or acetoxy group. Inorganic reactivity represents the covalent bonds formed through oxygen to the silicon atom, to form a siloxane type of bond. The alkoxy groups (-OR) can react with an inorganic substrate in both cases, forming covalent bonds between the matrices. Organic reactivity occurs on the organic portion of the molecule and does not directly involve the silicon atom. The organic functional part can polymerize with an organic matrix. The reactivity of organic groups attached to Si is similar to organic analogues in C-chemistry. Silicon is a major constituent of sand and rocks - very durable inorganic materials. Silicon bonds tenaciously to other inorganics such as glass and steel. Silicon will bond tenaciously to organic polymers as well when an organic group, such as aminopropyl, is attached to the silicon. This is because the reactivity of organic groups attached to silicon is similar to organic analogs in carbon chemistry. The chlorosilanes are distilled or purified and the primary product - dimethyldichlorosilane, (CH 3 ) 2 SiCl 2 - is reacted with water (hydrolysis) to give poly(dimethylsiloxane) oligomers: [Me 2 SiO]n. The whole process is self-contained: the chloride ion is recycled with the regeneration of methyl chloride via the reaction of methanol and HCl. Thus, only readily available raw materials are used and useful products emerge from this cycle. The reaction of the monomer organo-chlorosilanes with water (hydrolosis) or methanol (methanolysis) produces silanols, which, using HCl catalysis, lead directly to further reacted oligomers or polymer siloxanes ( 'sil' represents silicon 'ox' stands for oxygen and 'ane' describes the saturated nature of the bond ). The description 'silicone' for the whole class of polysiloxanes is an imitation of the oxygen-carbon bonds of carbon chemistry which are known as 'ketones'. The latter however, because of their particular characteristics, form double bonds instead of single bonds. [Me 2 SiO]n + Me 3 SiOSiMe 3 -> Me 3 SiO[Me 2 SiO]n SiMe 3 siloxane fluid. 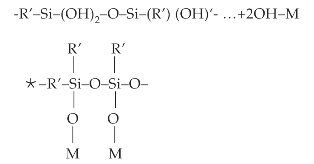 Mono-, di-, tri- or tetrafunctional siloxane units with Si-O bonds, arise from polycondensation according to the number of chlorine atoms of the basic silane molecule. • Monofunctional i.e., there is one Si atom with 3 alkoxy groups in the molecule e.g., vinyltriethoxy silane. • R-Si-3(OR) where OR=alkoxy group. · Bisfunctional i.e. there are 2 Si atoms, each with 3 alkoxy groups in the molecule e.g., bis(3-trimethoxysilyl)propyletylene diamine. The diverse halogenated silanes serve as building blocks for the synthesis of the various product types of silicones such as fluids or resins. Dimethyldichlorosilane enables the formation of long Si-O chains. At first, the hydrolysis or methanolysis of dimethyldichlorosilane gives a mixture of short chained, difunctional and therefore linear, siloxanes with OH groups as well as cyclic siloxanes, having normally between three and six chain units. The linear siloxanes show a helix structure with the methyl groups being freely able to rotate. All silicone fluids, emulsions and rubbers, are based on dimethyldichlorosilane.This is therefore the decisive base product. If the trichloro compounds are used, a cross-linking between the linear chains is produced as a result of the three reactive sites of silicon. A three dimensional network is the consequence. This process is crucial in the formation of silicone resins. Monochlorosilanes, on the other hand, because of their single reactive site, can only be used for the terminating of the chain growth by polycondensation. They react as a sort of 'capping agent' for the growing silicone chain. Silanes are applied in polar aqueous alcohol solutions (e.g., ethanol, isopropanol) and in ethyl acetate, but non polar solutions (e.g., n-pentane, n-hexane) have also been investigated. Siloxane polymers occur in a variety of common forms - fluids, gels, elastomers and resins - for a wide variety of applications. Silicon fluids are usually straight chains of poly (dimethylsiolxane) or PDMS, which are terminated with a trimethylsilyl group (or groups). PDMS fluids come in all viscosities - from water - like liquids to intractable fluids. All of these are essentially water insoluble. PDMS fluids may be further modified with the addition of organofunctional groups at any point in the polymer chain. Silicone gels are lightly cross-linked PDMS fluids, where the cross-link is introduced either through a trifunctional silane - such as CH 3 SiCl 3, giving a "T-branched" silicone structure, or through a chemical reaction between a Si- vinyl group on one polymer chain, with a hydrogen bonded to silicon in another. This chemical "tying" of siloxane chains produces a three-dimensional network that can be swollen with PDMS fluids, to give a sticky, cohesive mass without form. Silicone elastomers are cross-linked fluids, whose three-dimensional structure is much more intricate than a gel. In addition, there is very little free fluid in the matrix. Fillers, such as amorphous silica, are frequently added to the matrix to give greater reinforcement to the network and thereby increase the strength of the product. Silicone resins are more heavily cross-linked polymer networks, that are formed by the introduction of a predominance of tri- and tetra-functional monomers, such as CH 3 SiCl 3 . The physical properties of the finished silicone resin can be tailored to suit many applications, by varying the ratio of branched and linear siloxanes and also the functional groups attached to the silicon. Silanes are versatile materials used in a wide range of applications including adhesion promoters, coupling agents, crosslinking agents, dispersing agents, and surface modifiers. Previously, bonding between gold alloys and porcelain was mainly by micromechanical attachment techniques based on roughening the contact surfaces and applying hot temperatures. Silane coupling agents improve the bond of resin composite to ceramic, by about 25%. Evaluation of silanes establishing bonds to metal or ceramics, showed that silanes do not bond to the metal surface as they do with the ceramic. Siloxane bonds are sensitive to moisture between resin and ceramic matrix. Later, studies confirmed that the use of silane increases the bond strength of resin composite to HF acid etched porcelain. Newer ceramic repair systems consisted of MPS, Ferric chloride (FeCl3) and an adhesive opaque resin. Silanized interfaces appeared to be unstable in humid conditions and the silane bond deteriorated under atmospheric pressure. Since the resins are permeable to water, the bond between silane and resin composite was expected to deteriorate by hydrolysis, over time. Although the silane coupling agents are capable of forming bonds with both inorganic and organic surfaces,silane itself does not help bonding. Therefore it is used in combination with silica coating\Silicatization (i.e., air borne SiO2 particle conditioning, use of acidic primer) (HF acid etching), or heat treatment of silanized substrate. The main contribution to the increased bond strength was not made solely by the mechanical interlocking of the resin composite, but also by the formation of covalent siloxane bonds via silane treatment. Silanes on filler materials Silanization of the filler particle phase yields a better dispersion and wetting for filler particles and it also lowers the viscosity between a filler and liquid resin system, thereby improving the physical properties of composites. Silanization of E-glass and aramid fibers enhances the adhesion between the fibers and organic acrylic resin system in a denture material. Titanium and steel-silane coupling agents are of importance for the adhesion of resin composite to ceramic\metal. For an effective bond of resin to feldspathic porcelain and metal, the use of silane in combination with surface conditioning is required. The use of silanes with different techniques has been advised. Rocatec system (3M/ESPE), based on SiO2 abrasive particle (e.g., with 50-µm diameter), was meant for roughening the substrate surface. It increases the bond strength effectively, because of the increase in silica content on the substrate surface, that provides a basis for silanes to enhance resin bonding. This is called the Tribochemical method. The temperature at the surface while the particles are hitting, may momentarily rise up to 1,200°C, and the particles thus will be embedded in the surface. Silicoater MD (Heraeus Kulzer)- This method can be used in an extraoral process to attach resin composite onto metal surfaces. It was based on immediate pyrochemical silica layer formation onto the substrate surface. It was also used for cobalt-chromium (Co-Cr) alloy cast clasps coated with resin.Noble alloys roughened by CoJet Sand (3M/ESPE; silica coating), followed by silanization, had significantly higher adhesion results to resin composite. For both a gold-palladium-platinum alloy and feldspathic porcelain, a treatment of Rocatec-Preabrasion (with alumina particles), followed by an impact alumina-silica coating (Rocatec-Plus) and finally silanization by a commercial MPS silane is effective, when bonding a composite to alloys. • A nonfunctional silane, (3, 3, 3-trifluoro-propyl) trimethoxysilane, has been used in filler surface treatment. A majority of clinical studies pointed to silanes playing a significant role in the adhesion process. Silane reaction mechanisms were not entirely understood and there exist several theories for bonding mechanism, for silanes and substrates. The essential conclusion for the most effective silanes for adhesion, were that the silane backbone body should be rather short, the organofunctional part should preferably be methacrylic, the hydrolyzable groups should be methoxy and silane should be applied from ethanol.There is continuous discussion as to whether silanization is needed, or, e.g., whether acid etching by HF acid is adequate, for obtaining clinically relevant attachment of composite to glass ceramics. With ceramics that are not etchable to form a microretentive surface (e.g., alumina, zirconia), optimization of silane-promoted adhesion may play a great role in the future. Matinlinna JP, Lassila LV, Ozcan M, Urpo AY, Vallittu PK. An Introduction to Silanes and their Clinical Applications in Dentistry. Int J Prosthodont 2004;17:155-64. Pluddemann DP. Adhesion through silane coupling agents. J Adhension 1970;2:184-201. Pluddemann EP. Silane coupling agnets. Plenum: New York; 1991. p. 253. Chen TM, Brauer GM. Solvent effects on bonding organo-silane to silica surfaces. J Dent Res 1982;61:1439-43. Shell JS, Nielsen JD. Study of the bond between gold alloys and porcelain. J Dent Res. 1962;6:1424-37. Eames WB, Rogers LB, Feller PK, Price WR. Bonding agents for reparing porcelain and gold. An evaluation. Oper Dent 1977;2:118-23. Tjan AH, Nemetz H. A comparison of the shear bond strength between two composite resins and two etched ceramic materials. Int J Prosthodont 1988;1:73-9. Hayakawa T, Horiek, Aida M, Kanaya H, Kobayashi T, Murata Y. The influence of surface conditions and silane agents on the bond of resin to dental porcelain. Dent Mater 1992;8:238-40. Matsumura H, Kawahara M, Tanaka T, Asuta M. A new porcelain repair system with a silane coupler, Ferric chloride and adhensive opaque resin. J Dent Res 1989;68:813-8. Ozcan M, Alkumru HN, Gemalmaz D. The effect of surface treatment on shear bond strength of luting cement to a glass-infilterated alumina ceramic. Int J Prosthodont 2001;14:335-9. Kat OH, Matsumura H, Ide T, Atsuta M. Improved bonding of adhensive resin to sintered porcelain with the combination of acid etching and two-liquid silane conditioner. J Oral Rehabil 2001;28:102-8. Vallittu PK. Comparison of two different silane compounds used for improving adhension between fibres and acrylic denture base material. J Oral Rehabil 1993;20:533-9. Cobb DS, Vargas MA, Fridrich TA, Bouschliches MR. Metal surface treatment: Characterization and effect on composite to metal bond strength. Oper Dent 2000;25:427-33. Robin C, Scherrer SS, Wiskotl HWA. Weibull parameters of composite resin bond strength to porcelain and noblealloy using the Rocatec System Dent Mater 2002;18:389-395. Barbosa VL, Almeida MA, Chevitarese O, Keith O. Direct bonding to porcelain. Am J. Orthod Dentofac Orthop 1995;107:159-164. Eliades T, Lekka M. Surface Characteization of Ceramic brackets:A multitechnique approach. Am J Orthod Dentofac Orthop 1994;105:10-18. Winchester L. Direct Orthodontic bonding to porcelain:An in vitro study. Br J Orthod 1991;18:299-308. Purton DG, Love RM, Chandler NP. Rigidity and retention of ceramic root canal posts. Oper Dent 2000;25:223-227.